r. Kafka and Other Tales from the Time of the Cult, recently released by New Directions, represents the latest addition to the growing body of work by the late Czech author, Bohumil Hrabal, to be made available to an English speaking audience. 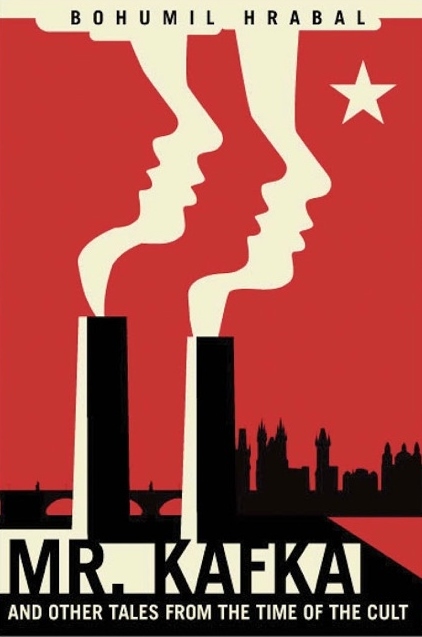 Composed and set, for the most part, during the early years of Communist era Czechoslovakia, this collection of seven short stories is deeply informed by a time when Stalin’s larger-than-life cult of personality loomed over a country unwillingly caught up in the thrust of major social and economic reforms. Yet, as the author indicates in his preface, this book can be seen as both a representation of his society’s evolution, and as an expression of his own creative evolution. During this period there was no single experience more profound for Hrabal, the writer, than his recruitment, in 1949, as a “volunteer” manual labourer at the Poldi Steelworks in the town of Kladno near Prague. Of course, Hrabal was also an aspiring writer whose literary explorations had, to date, been informed by the French Surrealists. He described himself as plucking bits and pieces from the likes of Rimbaud, Baudelaire, and Céline. But at Kladno his pretentious, “pseudo-artistic” world disintegrated. What he had once aspired to, he now recognized as insubstantial in the presence of the real things, real people, and real words that surrounded him. In the face of this artistic crisis, he came to understand that he needed to reorient his approach altogether, taking on the perspective of a reporter; drawing on the lives, work, and conversations of the people he encountered on the job, on the street and, most commonly, in the pub over a beer. With this discovery, Hrabal was on his way to developing the style of writing he would come to describe as “total realism”. The stories in Mr. Kafka, which primarily date from the 1950’s, can be seen as his earliest efforts to ground his approach to writing in the real world, and demonstrate that reality can potentially be at least as magical as anything the Surrealists might conceive. The steelworks have a starring role in four of the seven tales. The grandest and most ambitious of these is “Strange People,” set over the course of a single shift on the factory floor. The story opens with a sharp visual that will be evoked repeatedly, every time someone or something passes down the long factory hall through the ribbons of light created by the sun pouring through the louvers of the ventilation towers above. As the shift foreman approaches, the light casts stripes across his overalls. He emerges, passing the silent machinery that ought to be in full swing, to confront a group of grinders who are resting by the sorting table “knees up, their arms folded behind their heads, like extras waiting in the wings for their cues.” Quotas have been raised without consultation and, under the leadership of a former milk bar owner and devout communist nicknamed The Dairyman; the grinders are refusing to work. Meanwhile, a character known as the Judge struggles to get the hang of managing the two-button control pendant for the hoist that is used above the vats of acid with the assistance of a co-worker named Vindy. Early on he accidentally steps into a puddle of acid, so his shoe and pant leg will be eaten away as the day goes on. Over on the scrap heap, a group of female convicts unload freight wagons and toss metal crucifixes, coffin lids and other goods into hoppers to be carted off to the smelting ovens. The scene will shift back and forth between these groups. The grinders, which include in their number a cop, a priest, a lawyer, and a restaurateur; debate among themselves the merits and risks of their job action while continuing to argue their case up the ladder of management until they reach the Trade Union Rep. At the vats, as they move in and out of the clouds of caustic green vapours, and cross over rickety planks, the Judge treats Vindy to a stoic account of all of the ways that his life has improved now that his circumstances are reduced to living in a sparsely furnished basement room. In spite of the pleasure he claims to find in small acts, like burning the scraps of fine wood he salvages, his discourse is imbued with an absurd, tragic sadness. In the middle of it all, a film crew arrives to record a piece of propaganda entitled “Lunch Break in Our Factories.” The grinders are recruited to sit on a pile of ingots, hold newspapers and shout anti-American slogans. An aquarium is rolled in and birch saplings are arranged to approximate a grove of trees. Apprentices are directed to emerge from the “trees” singing and dancing, and to stand around the aquarium pretending to discuss the fish. Not willing to play along innocently, the grinders manage to convince the director to supply them with a round of salami buns for the sake of authenticity and refuse to stick to the script. “You’re making my life miserable! The grinder shouted, and he picked up a crowbar, tossed it from hand to hand, scattering little reflections of sunlight around the shop, then hurled it at a stack of cast iron slabs. The crowbar clanged and clattered to the ground, the echo of its voice dying away among the blue shadows. The grinder ran on to the stack, climbed over the slabs, quivering with rage, and stood there, sliced in two by a band of sunlight. “But Václav, I’m one of you, I’m a worker too, you know that, “ the manager said, placing his hand on his heart. The energetic, highly visual style typical of Hrabal’s writing throughout his career is already evident in these early stories He is freely drawing on the characters he encounters on the worksite, playing up idiosyncratic mannerisms, physical features, and environmental details such as, in this story, the bands of light falling onto the factory floor. However, if he is starting, as he desires, from the ground up, there is a gently exaggerated quality and a delicate balance between comedy and sadness that reaches back, not to the French Surrealists now, but to his Czech literary forebears, like Jaroslav Hašek, author of The Good Soldier Švejk. Those familiar with Hrabal’s work will know that he commonly employs a first person narrator to carry a story, either as the protagonist or as a secondary character. It is a striking feature of this collection that four of the stories employ a third person narrative, and that two of these tales – the one we have just examined, “Strange People”, and “Ingots” – are told from the perspective of a detached observer (“The Angel” and “A Betrayal of Mirrors” feature limited third person narratives). With a narrator who stands outside of the action, watching and recording the activities at hand, the characters are allowed to freely engage in conversation, from idle banter to intellectual discourse, and from political commentary to personal confession. Nothing feels forced or contrived as Hrabal manages a relatively large ensemble within a limited space. One senses that during this time he is developing his ear, fine-tuning his ability to listen, and laying the groundwork for the flowing, almost stream of consciousness style that will mark his well-loved longer works. A useful counterpoint lies in another of Hrabal’s early works, one that had its genesis as a series of tales that he collected from his uncle in 1949, but later cut and reworked into the rambling, one sentence discourse of Dancing Lessons for the Advanced in Age. In this novella, published in 1964, the narrator is an exuberant old man who regales a group of sunbathing women with an insanely wild account of his life and loves, augmented with digressions for his commentary on history, literature and, well, just about anything that crosses his mind. The irresistible charm of the narrator holds the story together. Hrabal’s well known later novels such as I Served the King of England, The Little Town Where Time Stood Still, and Harlequin’s Millions, tend to favour long sentences and paragraphs that can extend for pages, but make effective use of repeated images and motifs, and even recurring characters and locations – features that he is clearly exploring in the short stories he was writing in the 1950’s. In light of his earliest work, they seem to strike a balance between the staged structure of a story like “Strange People” and breathless intensity of Dancing Lessons for the Advanced in Age. The present collection, which was first published in 1965 under a title that could be translated as Want-Ad for a House I No Longer Wish to Live In, is framed by two stories that were originally written in 1950 as “epic” poems and later re-envisioned as prose. The title story, “Mr. Kafka” is set in the years between the end of the Second World War and the Communist coup of 1948. The narrator, with a clear nod to the writer with whom he shares a last name, has been unlucky in love, resides with an odd landlord and his wife, and spends his days checking invoices against products in the warehouse of the wholesaler for whom he works. After a day sorting toys he takes to wandering through the darkening streets of Prague. He meets and engages with a number of colourful characters, from a precocious child in the park, to a philosopher who invites him to share a grilled sausage, to the prostitutes who ply their trade by night. But in his heart he still pines for his beloved who, most curiously, is named Poldinka – a name that the steelworkers often affectionately applied to the Poldi steelworks. Our friend Kafka returns to close out the collection with “Beautiful Poldi”. Here the allusion is direct, this is a twisted love song to a cruel mistress. The reality of life for the steel worker, on the job, or after an accident or injury has left the unfortunate survivor maimed and disfigured, is played out in a mix of dialogue and long flowing passages. Life is fidelity to the beauty exploding all around us, even, at times, at the cost of our own lives. The newspapers, meanwhile, publish glowing accounts of the volunteer laborer who comes home from work and dances the Cossack Dance while sending mental telegrams of gratitude to the authorities, whereas in reality he coughs up black bile and collapses into his bed. Or a thirsty drop of molten steel swims through a roller’s eye, his wife’s image vanishes, and he tries, with ludicrous little steps, to dance away his misfortune. Hrabal’s own career as a volunteered steel worker was cut short when a crane fell on him in 1952. After recovering, he went on to work as a paper baler in Prague from 1954 to 1959. Although he was writing during these years, he would not begin to publish seriously until the early 1960’s and even then, his works were subject to censorship. By the time his books were finally appearing in print he was already into his 50’s. However, his foray into heavy industry was hardly a fruitless detour. Rather it would prove to be fundamental to the development of a unique voice, at once magical and grounded, that would help make him one of the best loved Czech writers of the latter half of the 20th century. Hrabal was, first and foremost, a gatherer and disseminator of stories: the stories of ordinary people – big dreamers, unlikely heroes, melancholy souls. He would face criticism for failing to take a more vocal stance against the Communist government, but it would wrong to assume that political currents do not run through his work. However, they take their place among all of the other aspirations and anxieties of human existence and, as such, hold to no overt agenda. Even if he did err on the side of caution, it did allow him to continue to collect and share the stories that mattered to him. And when a number of his literary contemporaries chose a life in exile, he stayed in Prague until the day he fell out of his hospital window at the age of 82, leaving behind 18 volumes of collected works. Within the context of his life and work, Paul Wilson’s translation of Mr. Kafka and Other Stories from the Time of the Cult offers a welcome and highly entertaining opportunity to witness an important moment in Hrabal’s self-identified evolution as a writer. Joseph Schreiber is a writer and photographer living in Calgary. He maintains a book blog called Rough Ghosts. He tweets @roughghosts.